For two sets of the same image and information, select the Twin Set option. Please note - if you select the photo option, you must send in a copy of the photo you wish to include to store@patriotguard.org . It is the customers responsibility to email this information. If you do not receive a email confirmation in response to your email within 48 business hours please email again. Chain not included, but may be ordered separately. Extended shipping time on this item. Please read the Proof Info tab. From Rick Crabb of Waxahachie, Texas on 12/25/2018 . 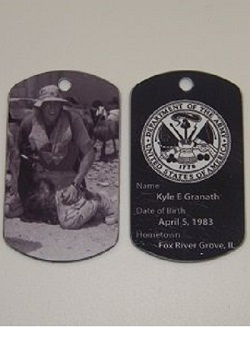 I could not be more pleased with the Keeepsake Custom Photo Dog Tags. They look amazing and the Store was gracious to engrave them exactly as requested. Fantasitc job and they came much sooner than advertise. You guys rock! 2/18/2018 – When you say 'one set' is that one double sided tag or is it two double sided tags? Response From Patriot Guard Riders: Single set means one double sided dog tag. If you choose the option to add a photo, within two business days of sending in your photo you will receive an email from design@fastcolorprint.com with an attached proof of what your final order will look like. Please watch for this email! We will need you to examine that proof and respond to the email with your approval or any changes required. Processing of your order will not proceed until we receive final authorization. Once the design team receives authorization, your order will ship within 14 business days. Special note - your entire order will ship together. If you require part of your order sooner than this time frame, you should order those items on a separate order so they will ship within the normal 5 business day time frame.